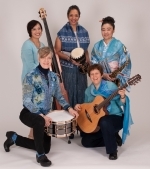 The first of four concerts in the Spring Musical Sundays series at the Morrill Memorial Library will be a performance by Women In World Jazz on Sunday, March 3 at 3 p.m. In this delightfully entertaining and educational tribute to female composers, five women will celebrate the diversity and power of creativity, presenting vocal and instrumental music from different eras, cultures, and styles. Women in World Jazz is an international ensemble bringing together some of the finest world and jazz musicians, each with an extensive background performing and teaching in the New England area. The program is designed for all ages, and audience participation is encouraged. To register for this concert, made possible through the library Endowment Fund, fill out the form below, call 781-769-0200 x110, or stop by the Reference or Information Desk. Capacity: 37 of 65 spaces available.